New Philadelphia A.M.E. / Rev. Jewell Holloway, Sr.
Rev. Jewell A. Holloway, Sr.
Rev. Jewell A. Holloway Sr. was born and raised in Niles, Michigan. He is a third generation A.M.E. minister, and the son of the late Rev. James L. Holloway Sr. and Katie Holloway. He has 4 brothers and 1 sister. He came to California in 1977 and joined Price Chapel A.M.E. where he served for over 20 years working in various facets of the ministry. Rev. Holloway later joined Grant A.M.E. Church, Long Beach, where he was an active member for 17 years. He and his family joined New Philadelphia in March of 2018. Rev. Holloway has a Bachelor’s Degree in Religious Education. He was licensed to preach in 2001 and ordained as a Local Deacon in the A.M.E. Church in 2004. Rev. Holloway is married to Patrice, and is the father of three, Tiffany, Jewell Jr. and Jessica. His oldest daughter Tiffany and her husband Amos Wellington III have three children, Grace, Katie, and Blake. Rev. 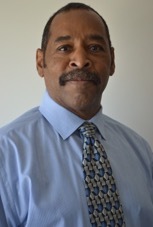 Holloway enjoys biking, bowling and roller skating and spending quality time with his family.